THP 1-13-022 HUM (Ward Road 2014 THP) Green Diamond Resource Company, 63 acres; 82% clearcut, 16% selection, 3% no-harvest logging. Lower Cannon Creek (HUM: T5N R3E Sec.6, 7, 8). Wet weather operations, moderate erosion hazard, steep slopes up to 65%, steep roads, landslide terrain, road failure sites, impaired 303.d watershed, coho watershed, oversized units, herbicides, 8 spotted owls within 1.3mi, osprey sightings, running pine, trees up to 48" dbh. Estimated public comment deadline: 05/11/13. 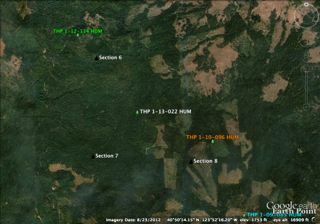 This THP is about 10 miles SE of Arcata, CA, or 4 miles SE of Korbel, CA and Highway 299 at an elevation of 1240 - 1800 feet. Green Diamond Resource Company is planning a mostly clearcut THP in the Cannon Creek watershed, which drains into the Mad River and the Pacific Ocean. The Mad River is an important coho, Chinook salmon, steelhead and coastal cutthroat trout fishery, and is listed as “impaired” for sediment, temperature and turbidity. Logging is planned in second growth redwood, Douglas fir, grand fir and Monterey pine using feller bunchers, shovel and cable logging. There are 2 oversized units, and 16 road related work sites including dip construction, ditch cleaning and culvert repair/replacement. Both units A & B are on large dormant earth flows, and 2 temporary steep short road segments are planned for construction on grades over 20%. Spotted owls were reported to be within .25 mi of unit A, and .5 mi of unit B, and a population of Running pine was found in unit A. More information is available on the THP Tracking Center website.